Fed up of messy waxing sessions and prickly hair growth after using a razor? If you don’t want to let your unruly body hair decide how you dress up, it’s time to choose laser hair reduction. Well, if your excuse to skip laser hair reduction involves ‘summer is the best time for it’ then keep on reading. 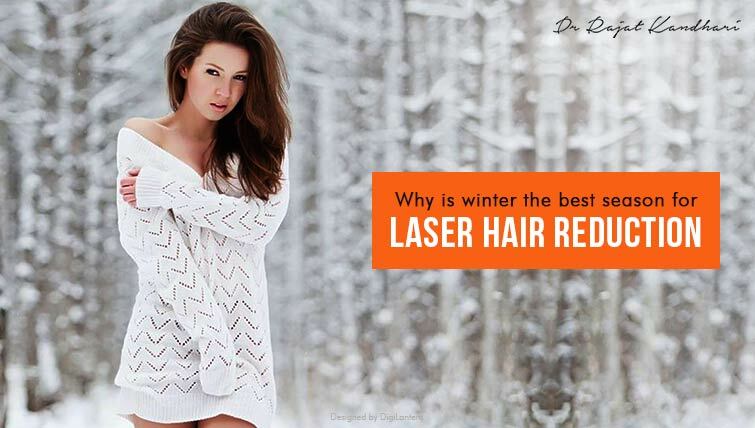 Why is winter the best time for a laser hair reduction? Following are some of the reasons to support it. Skin in winter is comparatively less tanned than in the hot summer days. This is because we stay covered under multiple layers of clothing and the exposure to the sun is limited. This is a good thing lasers are relatively contraindicated on tanned skin i.e., ideally the procedure should not be carried out or carried out with caution in order to prevent pigmentation later. After the procedure, our treated skin is sensitive and it is a good idea to keep it covered. With the chilly temperature, we tend to stay covered. Thus, making winters the most desired time for laser hair reduction. So, layer up for best results! Winter season sees lesser daylight than in winters. This means that the days are shorter and nights are longer in winters. Laser hair reduction requires patients to have minimal exposure to the sun before and even after the treatment is completed. Stay UV protected! 4. Good things come to those who wait! As you might already know, it takes a minimum of 6-8 sessions to get the optimum results with laser hair reduction. Start with your treatment in winters and by the time summer sun shines upon us again, we are ready to flaunt our summer body with NO sign of hair. The procedure can be a summer thing but in order to reduce the fuzz concerned, it is extremely convenient to get it done when the temperature drops. For any further details please feel free to reach out to us at info@drrajatkandhari.com.